There's Only One! . . . And it just got better! 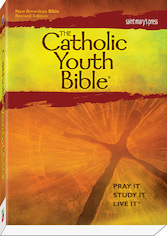 The Catholic Youth Bible in the New American Bible Revised Edition (NABRE) contains the new translation of the Old Testament and the new Roman Missal changes. The Catholic Youth Biblewill be a true companion, helping you find the answers you seek and helping you make connections to Catholic beliefs and traditions. Over 700 lively articles help you . . .
Pray It! Use the Bible for personal prayer. Study It! Understand and make sense of what the Bible says. Live It! Apply the Bible to real-life situations you're facing now. New! 40 expanded Catholic Connection articles that provide a more complete presentation of those Catholic teachings that are scripturally based. New! 28 articles that address the seven principles of Catholic social teaching. New! 40 pages of four-color inserts that help you pray, study, and live the Bible and Catholic teachings. New! Illustrations throughout to provide a visual context for the biblical stories. New! Over 275 articles updated to reflect contemporary issues and biblical scholarship. Biblical connections to many different cultures, illustrating the universality of the Catholic Church. Insights into how the Church has interpreted key Scripture passages throughout history. A glossary of Scripture-related terms. Five special indexes: Sunday readings for cycles A, B, and C; 10 color maps; a four-page color timeline; and three pages of full-color biblical art.